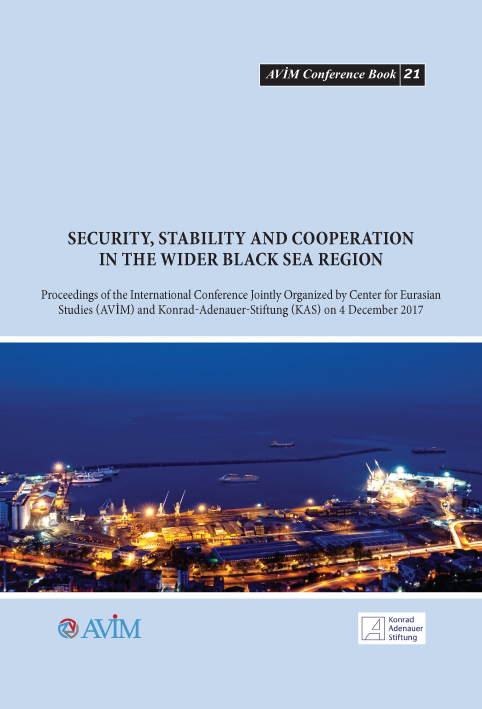 The conference book titled “Security, Stability and Cooperation in the Wider Black Sea Region” is based on the proceedings of the international conference jointly organized by Center for Eurasian Studies (AVİM) and Konrad Adenauer-Stiftung (KAS) on 4 December 2017 with the same title. “Security, Stability and Cooperation in the Wider Black Sea Region,” which was edited by AVİM Senior Analyst Dr. Turgut Kerem Tuncel, opens up with the forewords of Teimuraz Antelava (BSEC Legal Advisor), Sven-Joachim Irmer (Head of the KAS office Turkey), and Ambassador (R) Alev Kılıç (AVİM Director). These are followed by the introduction penned by Dr. Turgut Kerem Tuncel and twelve articles written by researchers and academics from the Wider Black Sea region countries who participated in the conference on 4 December 2017. We hope that “Security, Stability and Cooperation in the Wider Black Sea Region” will be a significant contribution for the scholarly community and the policy makers for acquiring expert views from the Wider Black Sea region.